For the search function in the bookstore to work, an item has to be listed on Amazon. Many OOP titles aren't shown there. Many more titles are available in our Bibliography, though. If you find a title in there, you can add it to your reading or wish lists just like through the Booksore Search function. I've spent much more this year on books than on weapons and armour though that hasn't always been the case. I get more regular use out of many of my books than I do my weapons. Thanks for pointing out the bibliography! I used it to add some more books to my list, and I also added a few I forgot about. I hope it's alright that I added some general medieval histories and biographies. I think an understanding of the society and culture in the middle ages helps add to knowledge about medieval arms and armour. Besides, many of my books have at least a picture or two, or entry or two, of armour or weapons! I can't believe I read most of those books, and medieval arms and armour is only one of my interests! Glad I could help. There's really no restrictions on what to add to your reading list. It'd be nice if it were focused on stuff on-topic to this site, though. I have general history, biographical and period literature books in my reading list. They all relate to each other and to this hobby. It's important to provide yourself with the context behind the weapons you like. To get back on-topic, thanks for digging through and finding examples of non-ferrous-metal-hilted swords, etc. as well as the other metallurgical info you found. I think there are enough of them appear to be user-swords that we can say that non-ferrous metals aren't inherently unsuitable for weapons use, even if steel/iron is a better choice and a stronger one. I'm tempted to buy that MRL rondel dagger and try to see if I can make the brass hilt fail. Destructive testing sounds fun, but it ain't cheap to buy something to try to destroy it. I have a feeling the blade will go before the hilt will. What will that tell us about brass hilt usage? Not much. It'll tell us more about MRL's shortcomings in general, I think. Just when you thought I was done with this topic, I thought I would post some pictures of the swords I mentioned in earlier posts. After all, a picture's worth a thousand words. Hope it's okay to use these! Oakeshott Type Xa. 17 from Records of the Medieval Sword. 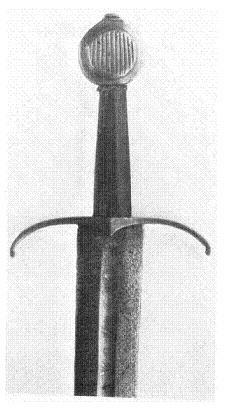 A blade of circa 1100, and latten hilt of circa 1450. Oakeshott Type X. 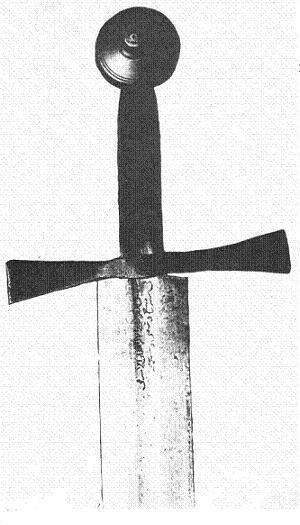 14 from Records of the Medieval Sword. 12th century blade with 13th century hilt of copper. Oakeshott Type XII. 17 from Records of the Medieval Sword. 13th century, with hilt of gilt copper. Oakeshott Type XVIII. 12 from Records of the Medieval Sword. Late 15th century, with bronze gilt hilt. Oakeshott Type XVIIIa. 5 from Records of the Medieval Sword. 15th century sword with hilt of gilt bronze. Oakeshott Type XXI. 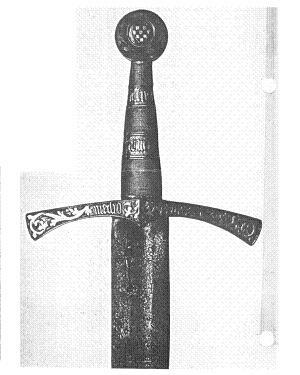 1 from Records of the Medieval Sword. Sword of Cesare Borgia, 15th century with a gilt bronze hilt. Bronze armour...and not just in the bronze age. Nobody would argue that the Romans used bronze scale armour because they had no ferrous alternatives. Clearly, the material was considered appropriate for defensive use in some contexts (lorica squamata- http://en.wikipedia.org/wiki/Lorica_squamata ). And didn't gladii often feature a bronze plate between blade and guard? Doesn't that count as a front-line use of copper alloy post-bronze age? I wonder if MRL's Brass Hilted Rondel Dagger has a one-piece hilt, or are the rondels separate pieces? Either way, the rondels look pretty stout. I would be surprised if the hilt broke easily, unless it was struck with a hammer! If that particular piece has a decent tang, the blade might actually hold up to a fair amount of abuse, barring any internal flaws. MRL's blades tend to bend rather than snap, unless they snap at the shoulders. That is one plus to the "bendy is better" mentality! I would think that a sword's cross made of brass would actually be more vulnerable to damage than a dagger hilt, even though brass (latten) was used occasionally in the Middle Ages. Even certain steel crosses might bend or break if banged hard against a shield or helmet. My old MRL/ Del Tin Man-at-Arms Sword has a cross similar to that on the Sword of Henry V (albeit much simpler). It's a decent thickness, but thinner than the crosses on my other MRL swords. Claude Blair, David nicolle, and others state that latten was used for pieces of medieval armour during the age of experimentation, from the late 13th to the early 14th century. The Black Prince's gauntlets that hung over his tomb in Canterbury Cathedral (now replaced by modern replicas) are made of gilded latten. They may be funeral items, but they look as usable as the helm and jupon. I would be interested to know about any other examples of medieval armour made from latten, or even bronze! Oakeshott Type XIIIb. 4 from Records of the Medieval Sword. Latten pommel. 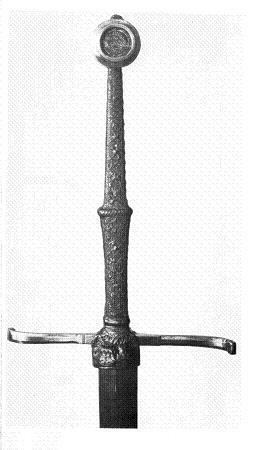 A clue to the use of copper for the cross of this sword may be found in an entry of the records of the Cutlers Company of London of November 1653 when the Court of the Company agreed to "suppresse and utterly abandon the worcking and trymming up of Swords, Rapiers and Skyrnes with Brasse or Copper hilts and Pummels wch are cast in moulds or any such deceiptful way", and in September 1639 "Certayne hilts handles and pummels of cast Brasse" which had been offered for sale in place of "Sufficient worcke made of Iron" were defaced by order of the same court. I suppose this begs the question of whether it was a flaw in the material itself or the process used at the time. They seem to specifically mention cast brass. Oakeshott uses the text above to assert that some swordmakers were substituting copper or cast brass, cleverly hidden under gilding, for iron. Sorry if this sounds un-scholarly, but brass/bronze coloured hilts appear in things like the Maciejowski Bible, and though this may be pure artistic licence, could it not perhaps be the case that the depictions may indeed have some bases in reality? While everyone is talking about the use of bronze/brass in the use of sword and knife hilts in Europe, I thought that maybe I should dig up some info on the use of said metals from their neighbors to the south-east. It seems that from what I gathered from my university courses on Middle-Eastern history, bronze particularly remained a very popular material for weapons and and everyday items right up to the 20th century. While regrettably the books and sources available to us do not go into much on period arms and armor, they provide various examples of period artwork. In one book, "Cambridge Illustrated History: Islamic World" they often show swords with hilt components made entirely of bright yellow bronze, this is often a depiction of 15th century Ottoman Turks at war, particularly with the sacking of Byzantium where various swords can be seen. Another depiction I found was one of the Mughal Emperor Shah Jahan of 1640 with his personal Guard at his court, possibly in Delhi. All of the Shah's guard were bearing "gurz" (maces) made entirely of bronze, and also wearing swords with nearly all of the hilt components in bronze, except one where the entire hilt appears bright red (copper perhaps?). Now as far as physical evidence is concerned, most of the actual swords that ive seen have embellished iron furniture so maybe in the depictions it might be as such, but I have also seen plenty with pure bronze so it could go either way. As for the use of brass im at a loss. I heard once during one of our professor's lectures he mentioned something about latten being used by lesser nobles to embelish sword kartouches and inscriptions instead of gold at times, other then that ive heard little about the use of brass. Perhaps brass was used in embellishing hilt furniture as well as bronze? This would add the nifty advantage of rust-proofing sword furniture without compromising the guard or pommels integrity, I know of many examples of this with Indian Tulwars. The problem is that we don't know if the goldish colour of the art is intended to represent brass, bronze, or gold. But you're correct, we have evidence in period art of that color. We just don't know what caused the gold colour to be represented. I rather like the look of brass furniture on certain swords, In fact I have MRL's two-hand claymore propped in the corner of my dining room and even the wife seems to like this heavy but attractive beast. But I got turned off of brass guards for functional use early on. I was trying to do something ridiculous (that I saw on a movie) with one of my first swords. I dropped the sword - and bent the thin brass guard. I ended up bending the other side to make them match. That's when I realized how flimsy it really was. My feeling was that a good sword stroke would have cut right through that guard. (I eventually gave that sword to a friend who was going through a difficult time - nothing better than a sword to cheer up a fellow). So from a functional perspective I guess it also depends on how thick the guard is - I would think that a thick chunky brass guard would be fine, if it doesn't add too make much weight and still looks balanced to the eye. Perhaps that the fundamental problem with brass - one will have to add more weight to get the same amount of strength. But back to history - I will ask a question here that I asked on another 'brass thread' and I don't think it was answered: Is it true that brass was used more often in damp climates like Scotland? I mean, it makes sense, but can anyone confirm this? 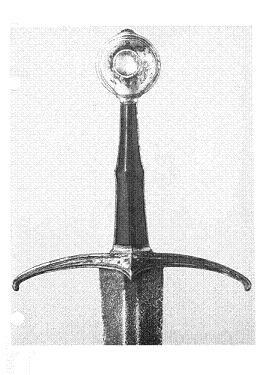 The Bayresheis museum sword (basis of the Albion Munich model) is actually not considered bronze gilt by Peter Johnson per his examinations. I am paraphrasing him, per my memory, when discussing the original's background. It is "fire gilt" gold. (A process requiring first bonding copper or silver alloy to the iron-steel core material, then fuming the gold on in the presence of boiling mercury. Very hazardous to the original craftsmen.) He pointed out the text book discrepancy in correspondence with me. No bronze was identified anywhere on the original by him. I think that some people think all brass is the same. As with any metal (think steel), there are various alloys and ratios of elements. As a trombonist, I come into contact wth a variety of brass alloys every day and I can tell you they aren't all the same. Some are harder than others. My guess is that the kind of companies that regularly use brass use the cheapest alloys they can buy, and those all seem to be soft. I have said all along that I think steel is a better choice. However, brass was used in at least some cases by people whose lives depended on their weapons more than many of us today. I would think historical blade furniture was frequently made in bronze because of the viability of casting "to fit" based upon molds of tang and blade base areas, rather than by forging. High copper-zinc bronze alloys would work, even with impurities (which were probably present in abundance.) I find this option attractive today as I consider the alternatives of special swages-drifts for punching, hot work grade fly press, and other things that would be best for forming furniture from steel. Casting of brasses/ bronzes takes much less of an investment, and less shop space to do in small scale project terms. Two things occurred to me. I could see people using copper alloys because of rationing. If, because of the movements and position of approaching enemy armies cutting of some of the iron/steal supply, they could use copper alloys for some of the furniture of the weapons to make sure they had enough iron and steal for armor and blades. Also, what about rapiers and small swords? They wouldn't be receiving, in most cases, as much of a beating as a longsword or side sword might. So brass and other copper alloys could be a more acceptable choice for them. i just thought i would pitch in my 2 cents on this topic as im greatly interested in swords that do not have iron fittings (being as about half the swords i own do not have iron/steel fittings) windlass recently discontinued a sword that i managed to add to my collection called the Sword of Cortenuova (as seen on kultofathena http://www.kultofathena.com/product.asp?item=...Cortenuova ) and i must say i like it, the brass looks good and its one of the best handling swords ive got. however im almost positive that if a sword came sliding down my blade and struck the cross guard i can probably kiss my hand good bye. so this rises into question in my mind if brass, copper, tin, silver etc were used as hilt components for swords, how common would hand injures sustained by a sword chopping though your cross guard been? not to get off topic from the thread or anything but i think that this too is something to look at when using not so very hard items in cross guards. , or grooving are about what you would be getting. Even then, the sword would be stopped, slowed, and/or redirected by the collision; so, I don't think injuries because of the sword getting 'through' would be a problem, though injuries from them getting around a, now, mangled guard would be the real issue. The alloy used for cannons were at the time stronger than cast iron, or at least not prone to catastrophic failure. It was also a lot more expensive so not all used it. I have seen a few examples where brass looked good on a sword, but are generally against it for aesthetic reasons.